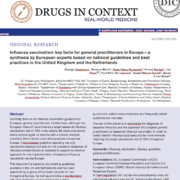 A group of European experts, including ESWI member Ted van Essen, has now published an overview of key facts about influenza vaccination for general practitioners. The aim of their effort is to harmonise the diagnosis of seasonal influenza and the approach of European general practitioners to seasonal influenza vaccination in order to move towards reaching the target vaccination rate of 75% throughout Europe. Interestingly, the paper is also published in a Word document so that European Countries (and any other country in the world) can easily re-use, translate or adapt the Key Facts and thus modify the document to their requirements. ESWI is now part of the business platform LinkedIn. Follow the latest influenza related news and ESWI’s business updates by clicking the Follow button on ESWI’s LinkedIn page.